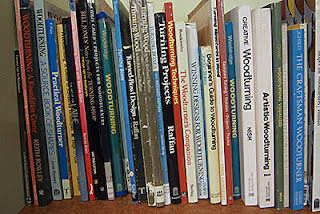 Our library is very very well stocked with books and magazines, I counted about 50 books on wood turning alone one day and loads of books on carving also. Some changes are now implemented and when all books are sorted into their cubby holes and order then it will be open to the "public". When one wants to loan a book or magazine then he / she is required to write down name, title and date on a sheet of paper which is replaced monthly, in a folder on the desk. So please make an effort to stick to the rules and return the loaned item within a reasonable time. It is also possible to copy pages if required on our copier. Just about Anything woodwork related is available from our own library so pick up some books and learn a few new things to keep the grey matter ticking over. Great to see the library open.